We are a traditional sign painting and gilding sign shop; creating bespoke hand painted signs, window displays, large scale murals and everything in between. All of Seven 9 Sign's signs are custom built, prepped and hand painted in their workshop. This takes time so timescales have to be carefully set out before any works are started to ensure client deadlines are met. If working on site, a visit would ideally be made beforehand to ensure access and health and safety factors can be considered. There are limitations to the craft of gilding and sign painting, whether it be financial or experimental, however Seven 9 Signs love a challenge and are happy to discuss and carefully consider any project. .pdf, .ai, .jpeg, drawings on napkins! Seven 9 Signs was founded in 2014 by Jim Kerr. 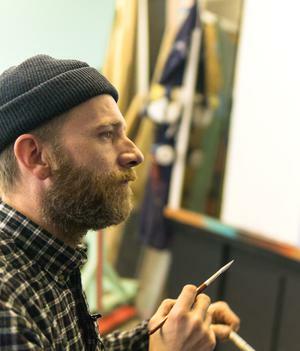 With a background as a typographical artist Jim was drawn to the traditional skill of sign painting and in 2010 he began incorporating sign painting into his artwork. He developed his skills with one of the only traditionally trained sign painters still working in Birmingham and after hours of practice each week over several years, and lots of freebies for mates, he realised that he could turn his passion into a full time job.